The Province of Kalinga is known for its vast agricultural land area. It takes pride with its farm produce such as rice, coffee, and variety of fruits and vegetables. However, this does not transcend to the younger generation of the Province. In 2016, the Department of Social Welfare and Development- Cordillera Administrative Region (DSWD-CAR) through the Supplementary Feeding Program (SFP) has identified 832 severely underweight and underweight children in Kalinga. This is out of the 7,555 day care children weighed in the child development centers (CDCs) in the province. With this, the province made its own menu to help these children grow towards a healthier tomorrow. The province fully supported the implementation of Gulayan sa Barangay or the practice of backyard gardening. It is practiced not only in CDCs, primary and secondary schools but in the whole community. Instead of planting ornamental plant on road sides and on other free spaces, people also learned to plant fruits and vegetables. The local government unit (LGU) has released ordinances and resolutions promoting such practice. 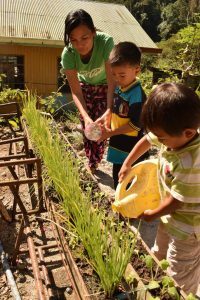 In the municipality of Pinukpuk, a municipal ordinance was released in 2016 which promotes backyard gardening in different offices, especially in schools and CDCs. 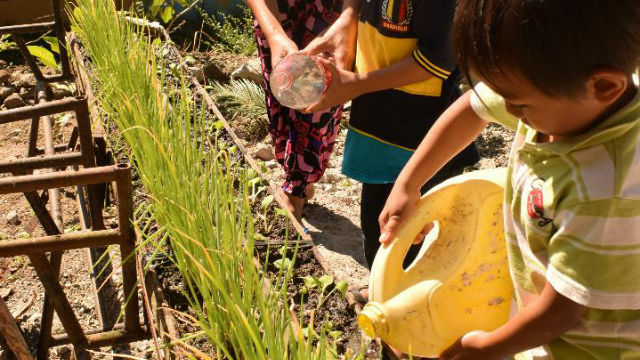 For Tabuk City, backyard gardening has been pushed since 2015. What started from the initiative of Child Development Workers, the City LGU reinforced the effort by starting the search for the best backyard garden in 2017. “We really pushed for the setting-up of gardens in our schools because we want to provide our children safe, fresh, delicious, and nutritious fruits, vegetables and crops which are very helpful in improving or sustaining the nutritional status of the children”, Social Welfare Officer Marydhel Lattot of Tabuk CSWDO shared. “The parents show initiative in maintaining our gardens. We are also helped by our barangay officials. They come to the garden in the morning and in the afternoon to tend to the plants.”, said Day Care Worker Kenny Lloyd Cadiente from Brgy. Mapaco, Pinukpuk, Kalinga. “The parents, who also happen to be farmers, assist us in identifying the plants to be raised in our garden. This help us in ensuring that we grow in-season crops.”, shared Day Care Worker Concepcion Raymundo from Brgy. Cullayanan, Pinukpuk, Kalinga. Adults are not the only ones who take responsibility in the gardens. Even the children do their part in ensuring that their plants grow well. “Parang hobby na rin namin ito. Kasama ang mga bata, nagtatanim kami. Nagtatanong sila tungkol sa mga tinatanim namin. Makikita mo na interisado sila”, Luzviminda Idanan shared. Idanan is a grandmother to a 4-year old day care child from Pinukpuk, Kalinga. “Even during school break, parents still visit the gardens to maintain the plants.”, said Day Care Worker Magdalena Andomang from Brgy. Ableg, Pasil, Kalinga. This practice has helped the implementation of Supplementary Feeding Program in the province. The produce supplements the PhP 15 provision covering the rice and viand of each child. “Yung mga na-haharvest namin, yun ang iniluluto namin para sa feeding. Kahit wala pa yung fund from the program, may nagagamit na kami,” Tabuk City Day Care Worker Josephine Dumallay shared. Aside from this, children are encouraged to eat vegetables since they grow them themselves. 4-year old Troy Oplay learned to eat his vegetables and fruits. During classes, the children are also asked to share about the vegetables that they ate. Backyard gardening doesn’t only put quality food on the table but also provides households the opportunity to save since they will not be buying from the market but instead earn by selling their products. This also help some centers who have the challenge of providing fresh food for the children due to the absence of a market place in the area. Meanwhile, after the 120 days of Supplementary Feeding, there are 624 children who have shown improved weight. Malnutrition and hunger could not be addressed by SFP alone. For the Province of Kalinga, they have already discovered the menu to improve on these challenges. Aside from the funding from the National Government, the local government unit, and the communities themselves have given their contribution on this. The religious sector has also participated in this endeavor. “Assemblies of God Church is providing manna packs to 25 DCCs in the municipality of Pinukpuk. The assistance is said to be implemented for 50 years.” Pinukpuk MSWDO Fatima Lagayon shared. “We would like to recognize the support of each stakeholder in the implementation of SFP in Kalinga. Through our concerted effort, we are able to prepare a healthier tomorrow for our children. We hope that time comes when malnutrition is no longer a problem in our Region”, DSWD-CAR OIC-Regional Director Janet P. Armas shared. For the 7th cycle (2016-2017), the Supplementary Feeding Program (SFP) is able to serve 7,609 children in Kalinga Province.